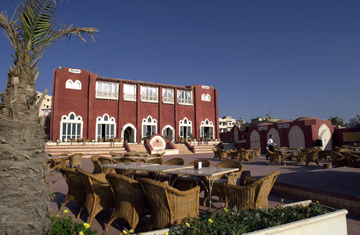 The Al Deira (aldeira.ps) is a splendid, breezy hotel on the Mediterranean that can be reached only if you are an aid worker or a journalist  or you are someone who chooses to enter the Gaza Strip by a smugglers' tunnel from Egypt. I don't recommend the tunnel route; these snake holes deep in the sand tend to cave in and are frequently bombed by Israeli fighter jets. The Al Deira would be a classy hotel anywhere. But part of its allure is its sheer contrast with the rest of Gaza, which has been ravaged by three years of economic blockade, a fratricidal war among Palestinians and, seven months ago, a full-bore Israeli air, land and sea assault that lasted 22 days. After traversing Gaza's blasted urban landscape, you arrive at the hotel like a desert wanderer plunging his head into oasis waters. With its cool shadows and an inner courtyard trapping pools of light, the Al Deira has an Ottoman elegance. You're led to your room along corridors where a wisp of sandalwood incense plays in the light sea breeze. The 22 rooms are a revelation: high, domed ceilings with views of the beach below, where Gazan kids play in the surf. It's worth remembering that the little soaps and shampoos, which we take for granted in most hotel rooms, have to be smuggled in from Egypt since, bafflingly, they are on Israel's long list of banned items. So is window glass, which is more awkward to carry through a tunnel, so don't be surprised if you open the curtains and find the window starred by a bullet hole. The TV images coming out of Gaza usually show masked Islamic militants waving Kalashnikovs. But another side of Gaza reveals itself at Al Deira: its peace-loving middle classes. Every afternoon, well-dressed families descend on the hotel's seaside café. Little kids swarm over the slide and jungle gym in the corner while their parents relax with a fresh strawberry shake and a puff from a water pipe. At twilight, a wistful silence passes over the cafégoers as their eyes follow the sun on its westward passage to lands that they, as Palestinians trapped inside Gaza, can never hope to visit until Israel lifts its blockade. The Al Deira opened in 2000 during "optimistic times," says its manager, Samir Skaik. They were short-lived. Soon after, the intifadeh, or Palestinian uprising, started, and there has been fighting and mayhem ever since. The same ingenuity that Gazans show during these hard times  running their cars on used vegetable oil when gas is cut off or rebuilding houses out of mud bricks because Israel has yet to allow in construction materials after its last offensive  applies to running the Al Deira. "Of course we thought of shutting down. But we have loyalty to Gaza and to our employees," says Skaik, who tells his staff, "Leave your problems at the door. Come in with a smile. The guests expect it." But aside from journalists and a few diplomats, guests are rare. For nine years, the Al Deira staff have been waiting for the arrival of peace, and tourists. Some day, says Skaik confidently, "tourists will come to Gaza." And the intrepid travelers will find a hotel that blends the best of Arab hospitality and style.